As someone who isn't usually drawn to florals I seem to have bought a lot of shoes and clothes with flowery motifs. Like the booties I bought for my birthday. This picture shows that the bottom of the dress is embroidered with a scalloped pattern. 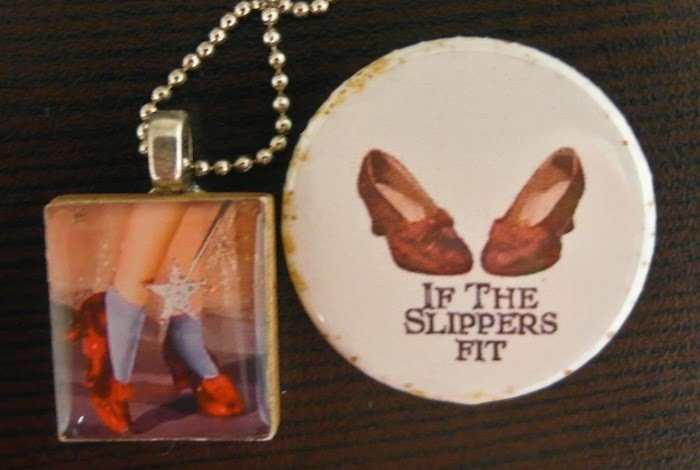 And my button and necklace were of a similar theme. Apropos for moi? This is the "happy accident" to which I'm referring in the subject. I bought this dress at Meg not knowing that I would match some older Fluevogs that I have owned for about 5 years. My penultimate boss was all "oh Megan, your shoes match your dress perfectly" and she wouldn't believe me when I told her that it was just a happy coincidence! It makes me so happy when that happens!!! You look lovely in these outfits, as always. The orange dress is a great colour on you! The colours in the striped one are fun - I've always thought brown and blue look good together. What serendipity! So matchy - love it! You do look fab in orange - great colour on you. fabulous happy coincidence!, that kind of things cheer up my day usually!, and your shoes and striped dress make a really nice couple!, lovely! And your embroidered dress is gorgeous!, pretty color and pretty details!, I was not a fan of florals but now I'm in their possession, so take care of yourself!. Oh my goodness don't you look very clever with all that gorgeous coordination! I love both of your outfits majorly! How do you find the fit of eshakti dresses for a taller person? I am a bit over 5'9" and I find dresses rarely fit me well, with the waistline usually hitting me too high. I love florals but I realise I tend to like larger ones. I would be drawn to smaller ones but not wear the item and then one day I realised it was the small florals I never wore.